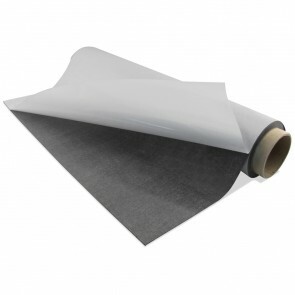 This product is 1 foot increments that are quick-cut off a roll of 20 mil Indoor Adhesive Magnet that is 24.375" wide'. 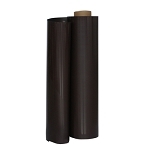 The rolls have adhesive on one side and plain black magnet on the other. Only one side (black magnet) is magnetic. If you order a quantity of 1, you will receive a piece of magnet that is approximately 12" x 24.375". If you order a quantity of 5, you will receive a piece of magnet that is approximately 60" x 24.375", etc. Remember, these are quick-cuts off the roll and will NOT be perfect.